Following the successful CoreNet panel Working in Gray Space, Holly Dutton of Real Estate Weekly interviewed BAM Principal Ross Cole about his insights on how Gray Space is transforming the future of office real estate. Read the article at Real Estate Weekly. BAM Principal Ross Cole moderated an engaging panel exploring how real estate strategies are impacted by Gray Space trends. Gray Space is non-traditional ways people work in unconventional places. 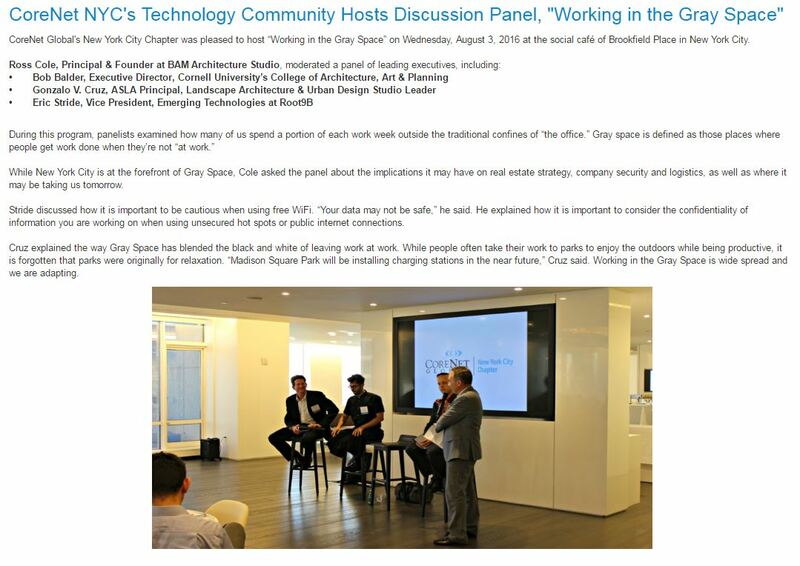 The panel was held on August 3rd in collaboration with the CoreNet Technology Committee. Ross was joined on the panel by Robert Balder, Executive Director at Cornell University, Gonzalo Cruz, an urban designer, and Eric Stride, a security technologist. The CoreNet panel yielded helpful takeaways on the transition to Gray Space work and how this will affect the future office. Quest to spur industry disruption. Companies are taking space in shared offices specifically to encourage “speed to innovation” that comes from combining a diversity of people. The blending of varied departments is shown to result in faster industry game-changers than the silo world of working. To encourage this frictionless collaboration, Cornell University intentionally commissioned a building to house multiple specialties. In past years, academic programs were more likely to be found in separate buildings. Hardware is becoming worthless. Technological advancements mean the work is no longer about the hardware. Instead of relying on a computer or phone, many see the future in virtual desktops. The virtual desktop contains all an employee’s files and can be called up on any device, anywhere. It’s more secure than storing data on a mobile device and improves working agility. Today, workers are asking for USB charging stations in parks and meeting places. Instead of carrying laptops or USB drives, gathering spaces of the future may build devices directly into the environment. This will allow people to have screens to work on whether they meet in a bar, a Starbucks, or even a park. Hacking using old technology – eyes and ears. While the value of the hardware is becoming less important, the sharing of information in public environments is becoming more common and therefore more of a security concern. Sharing information in Gray Spaces means the information could be taken, creating issues for the companies. Stolen information could result in a variety of problems, including insider trading that lands a company in trouble with the SEC. The public sharing could also cause the theft of intellectual property, impacting the pipeline of an R&D organization. We haven’t been trained to be conscious of hacking; we just keep clicking “yes” to get WiFi access without ever really considering the implication. Attention needs to turn to protocols to remind workers to remain aware of their surroundings and use their eyes and ears to be vigilant of the security compromises that may arise when working in Gray Spaces. What makes for a successful design of a life science facility? The Urban Land Institute Los Angeles and the LA Bioscience Hub arranged a panel of experts to discuss the forces shaping architectural design of the fast paced, dynamic field of life science research. Brian Spence, founding principal at BAM Architecture Studio, served as the sole architectural voice on the panel. Brian used a case study model to articulate how to take advantage of recent biotech design trends. He first identified the design trends. 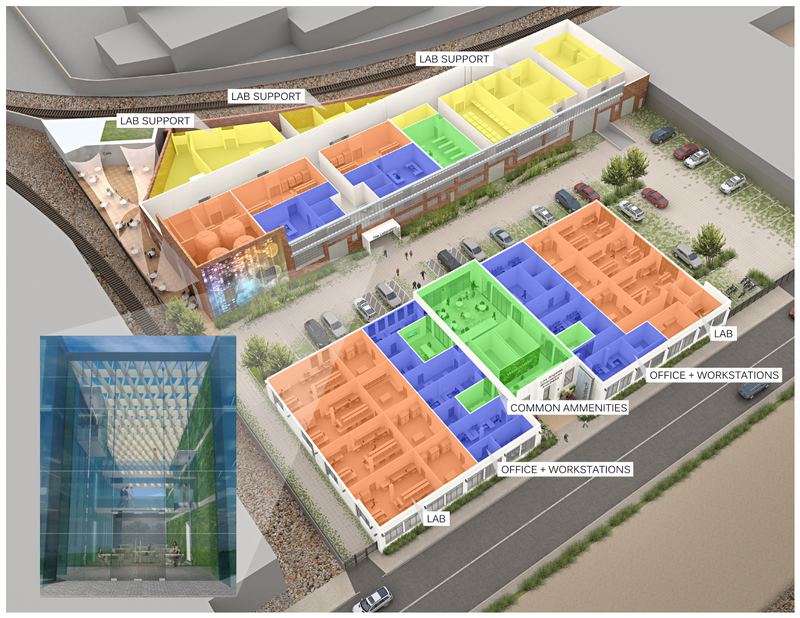 Then, he presented one real world design solution to the R&D community in LA’s flourishing BioScience Corridor. Brian Spence, founding principal at BAM, has been invited to be an expert panelist on life science facilities by Urban Land Institute (ULI) Los Angeles and the LA Bioscience Hub. The event will focus on the opportunities and hurdles associated with designing for the biosciences. Join Brian and the other industry leaders as they bring these topics to life through a case study and site tour at the La Kretz Innovation Campus, a hallmark building in clean technology development. Register for this event at ULI Los Angeles. Two of our firm’s Practice Leaders, Ross Cole and Daniel Castner, will share their expertise during this year’s Research Facilities Conference. Speaking on a panel with Joseph DelPozzo of WSP Group, Ross and Dan will present two leading strategies to attain the research capabilities that allow an institution stand out. Comparing case studies on upgrading an existing lab building versus constructing a new lab building, the panel will share best practices that help clients make vital decisions for their organization.